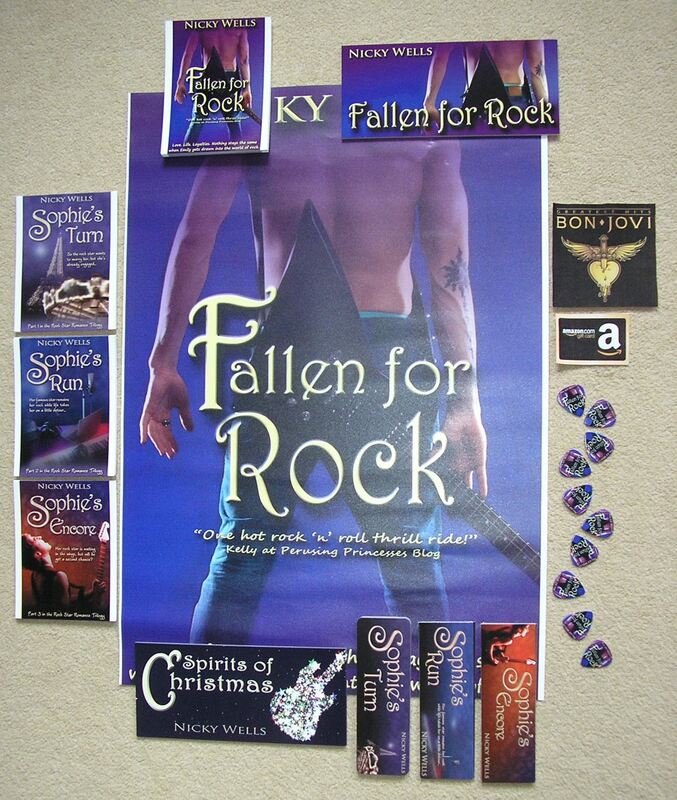 Last week, it was my pleasure to pick winners for the Fallen for Rock launch giveaway extravaganza. 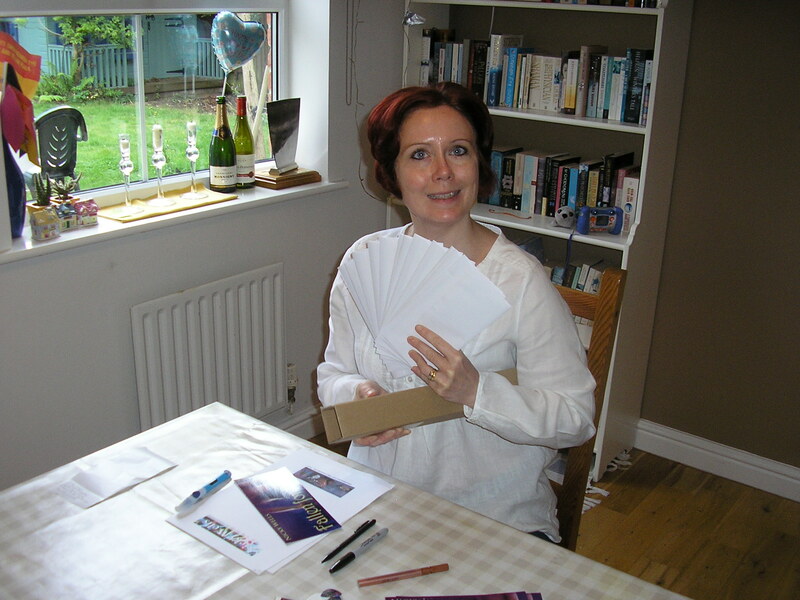 Over the weekend, I had a blast packing up prizes and writing letters. And today, I posted the whole lot out. I have a huge smile on my face even now. I simply can’t help loving sending ‘stuff’ to readers and fans. I guess that’s why I keep running giveaways! That’s it for now, my friends. Fallen for Rock is now well and truly launched, but it’s not very long until Fairy Tale in New York will come your way, so watch this space. Rock on! 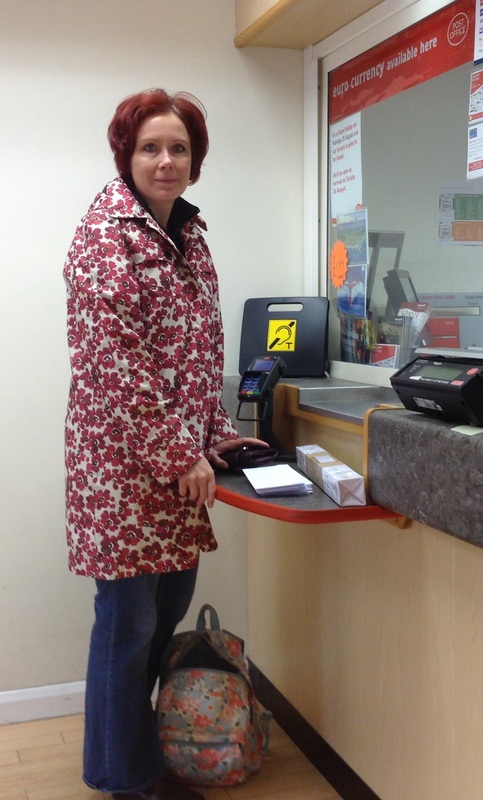 One of my favourite perks of the job: Picking Winners! 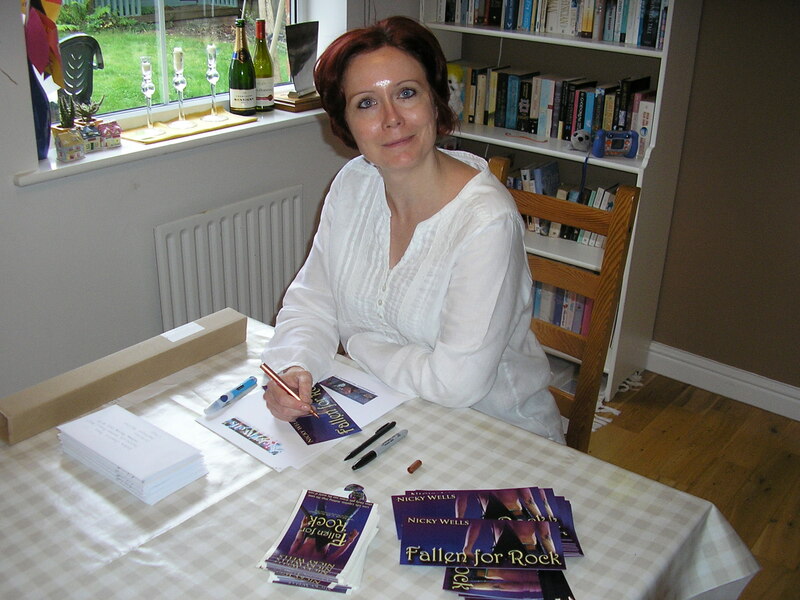 The launch tour of Fallen for Rock is drawing to a close, and what a blast it’s been! The giveaway registered 3,258 entries, and I just had some serious fun picking the winners. Well, actually, Rafflecopter picked them for me, but it’s awesome to see names appear. I hope everyone will enjoy their prize! Congratulations if you are a winner! If, however, you haven’t won on this occasion, watch this space for future launches and random giveaways. Publishing a book is like giving birth. It’s a long time coming, it involves a whole lot of blood, sweat, and tears, and the euphoria when you finally hold your baby in your hands is second to none. I gave ‘real’ birth twice, to two wonderful little boys. But this is my FIFTH book baby, and the emotion, excitement and pride are every bit as intense as they were for the previous four book births and their real life flesh-and-blood-baby counterparts. 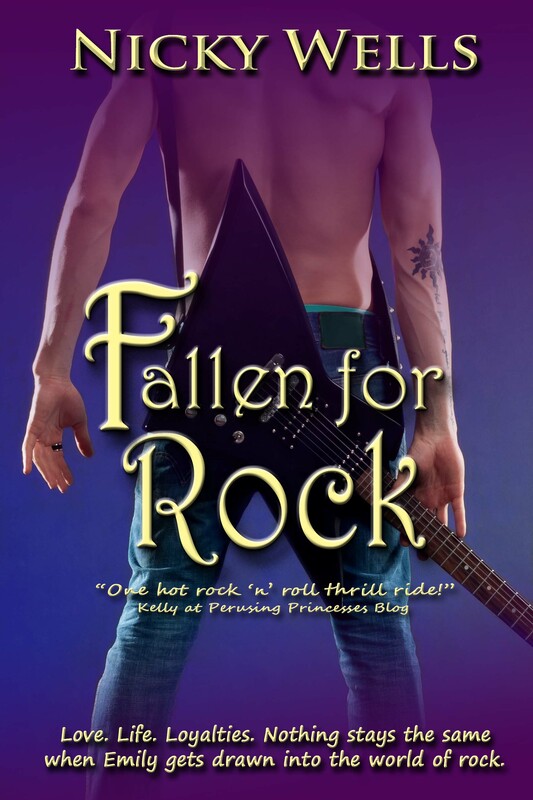 Fallen for Rock: Out today! Join me today, 30 June 2014, on Facebook and Twitter for all-day launch festivities including games, music, flash giveaways, and virtual food and drink. 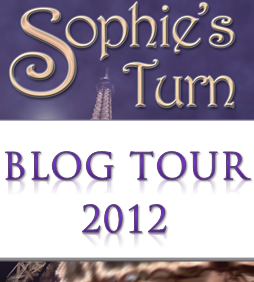 The Small Print: Giveaway is open internationally. Giveaway entrants must be aged 18 or over. Giveaway closes at midnight on 14 August 2014. Winners will be notified by email. 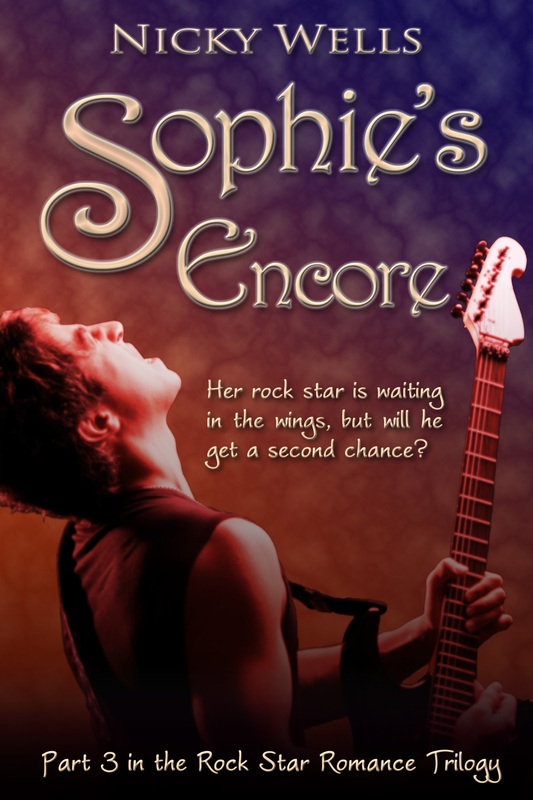 I write romance with rock stars. I know all about touring. Of course I’m taking this release on tour! Here’s a list of all the wonderful blogs that will be hosting Fallen for Rock with reviews, guest posts and/or interviews over the coming weeks. Give these bloggers a big round of applause when you stop by there: they are truly amazing, and I couldn’t do what I do without their support. Have you Fallen for Rock yet? Now I’ve been an Amazon customer since it was first born way back when and a KDP author since 2011. I’ve never seen a screen like that. My first reaction is abject terror. What is going on? I have a book launch on Monday. I need to upload my book file urgently. KDP can take anything from 12 hours to 48 hours to upload a file to Amazon. With that, I have to walk a very fine line. I don’t want the book available too far ahead of launch day because that’ll spoil the fun. I definitely want it available on launch day because otherwise… that’ll spoil the fun too. Thus I thought: Upload on Saturday morning for a Monday release. That ought to do it. Right? Yes. 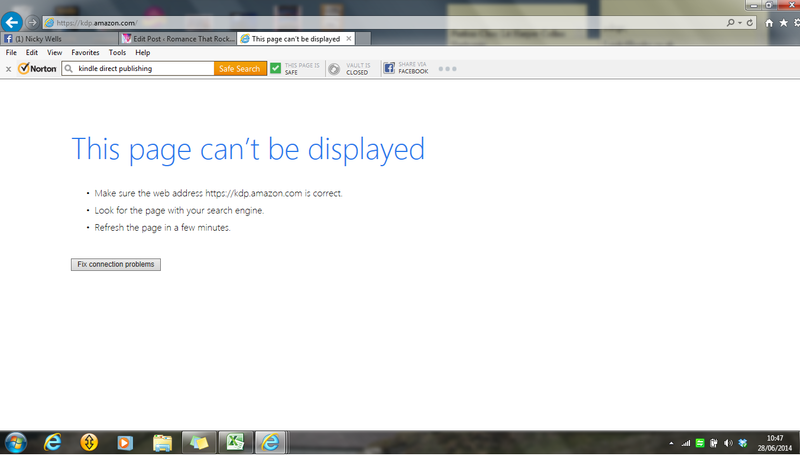 Unless, of course, I can’t get the book uploaded!! 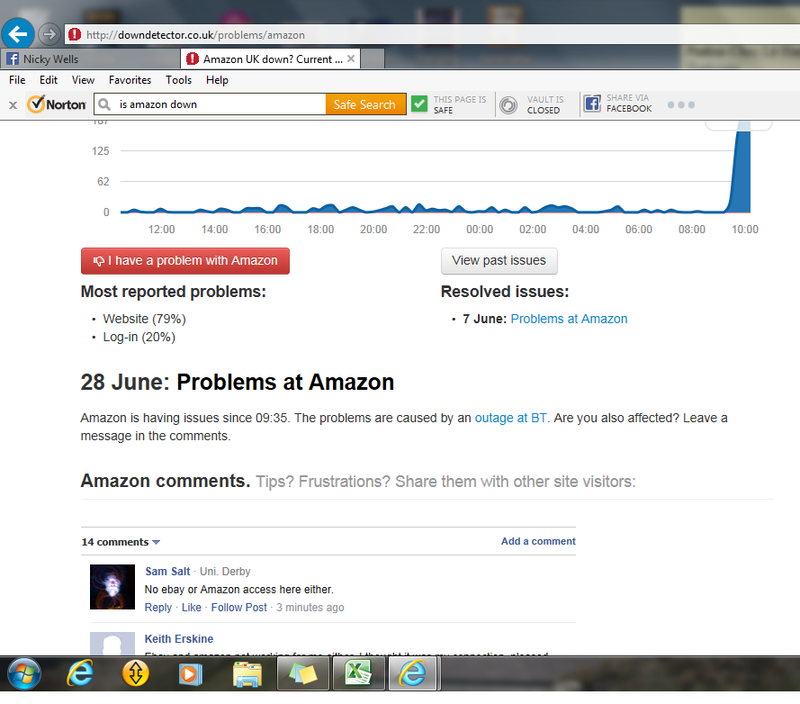 So I do some digging, and it turns out that the problem doesn’t lie with Amazon at all. I dig some more and discover that the problem is countrywide… (we’re talking UK here, of course). There’s nothing much else I can do right now except sit tight and wait. At the time of publishing this post, all the affected sites, including KDP and Amazon, are still unavailable to me. Don’t get me wrong. I know technology goes wrong, and I suspect (hope!) 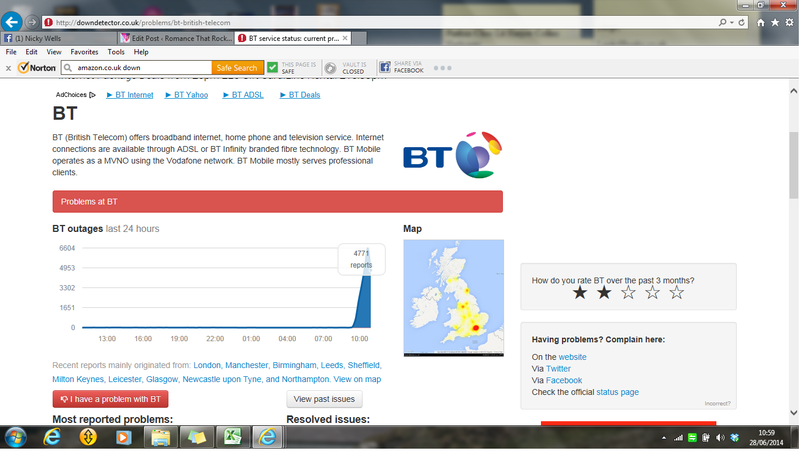 that the good folks at BT are working like mad to get this fixed. But why did it have to be this particular Saturday morning? I mean, come on, I only upload books twice a year! And the reason I’m writing this? Well, for one, it gives you a lovely insight into the world of publishing, specifically the last minute hiccups that make life so very exciting. 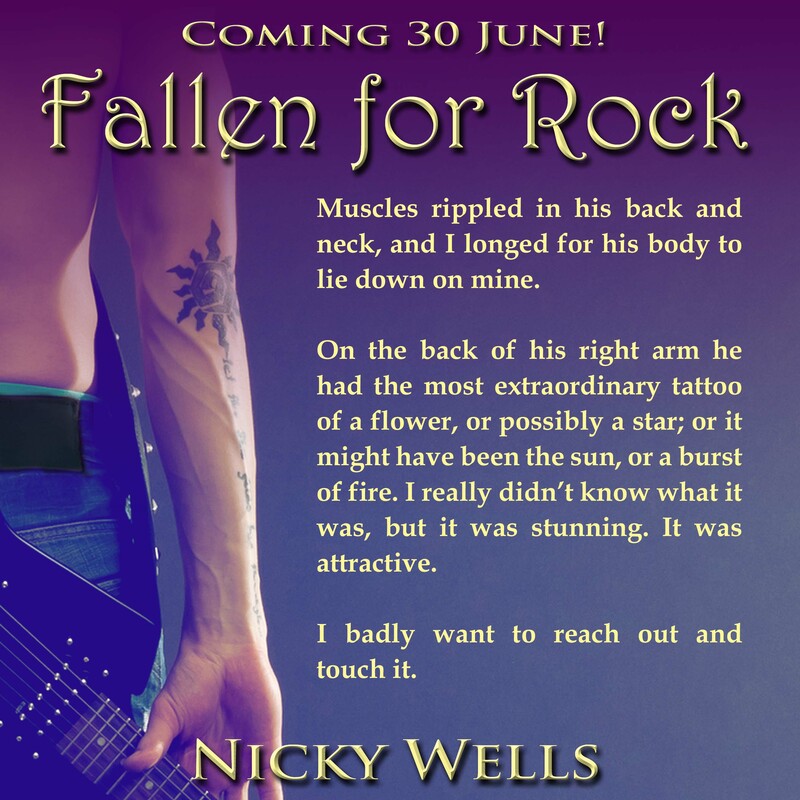 And for another, it’s just so that you’ll know why Fallen for Rock may not be available very first thing on Monday morning, 30 June, as previously promised. But I’ll do my utmost to make it happen. 12:46pm ~ POSTSCRIPT: My hopes were fulfilled and prayers granted!!! The outage ceased, the sites became available, and the book is uploaded pending review and going live… squeeeee! Eighty percent orgasmic because of a deep voice and a bit of humour?